Ferret racing and sampling local foods were among the activities held across the region to celebrate Yorkshire Day. Penistone hosted the main celebrations as more than 100 civic leaders from across the county paraded through the market town before a church service. Other events included readings of the traditional declaration of integrity and performances by local brass bands. Yorkshire Day was started in 1975 to restore pride in a county undermined by the loss of its traditional industries. It falls on 1 August to mark the date in 1759 when soldiers from Yorkshire regiments placed white roses alongside fallen comrades on the battlefield of Minden in Germany. 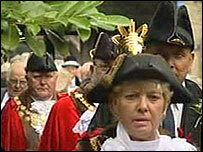 The Mayor of Penistone, Nora Collett, said the town's people were very proud to stage the county celebrations. "The people of Yorkshire are gritty, plain speaking, decent good folk who chat to their neighbours and all that friendliness is in celebrating the Yorkshire traditions," she said.